On-foot ARDF, also known as Radio Orienteering or Radio-‘O’, is popular in a number of countries, particularly in Central and Eastern Europe. The more formal competitions, at both national and international level, conform to rules set by the International Amateur Radio Union (IARU). It is a combination of Radio direction finding and orienteering. Five beacons (or more) are located in a wooded site and transmit for one minute, in sequence, on the same frequency. A unique call sign identifies each transmitter. The objective is to work out their locations from radio bearings, devise a route plan and then visit them, on foot, as quickly as possible. The radio beacon site are also referred to as a ‘control’ or more commonly as a ‘fox’ (as in fox hunting). Each competitor has a receiver and a compass and is given an individual start time. At, or near, the time of the departure, the organizer will issue a map (1/10000 or 1/15000) showing only the course start and finish. A control card is also issued, and must be marked with a pin ( or electronic) punch at each transmitter location as proof of discovery. Each transmitter will be co-located with an orange coloured orienteering flag. The competitor, using his/her receiver, will try to identify the location the various beacons, by taking bearings and optionally plotting them on a map. Your radio bearings may initially be ambiguous and you will need to refine your route plan as you progressively uncover the location of the controls. Some will follow bearing directly, others prefer to circumvent obstacles by map reading, and then use well marked paths… it is all is matter of strategy. In local UK events you usually have a choice of course lengths, with more or fewer foxes to find. The winner will be the one who finds their quota of foxes in the shortest time. In larger and formal international ARDF events courses are assigned by age and gender. On average, the event is limited to 120 minutes. Penalties for going over the limit are very severe. If you do over-time you will be ranked by time alone, regardless of the number of transmitters found ! International events usually take place over two days. One day using 2 meters (144MHz), the other day using the 80 meters band (3,5MHz). If you are interested in designing and building radio equipment, then there is great potential with ARDF. The pages on this site just scratch the surface! The aim for many, will to compete for fun, not necessarily for an outright win, but a chance to test themselves and their equipment against the course planner and like-minded friends. ( this describes G3ZOI interest! ). Local events usually have an option of an easier course, for beginners, the less active or old duffers! Specialist clothing is definitely a not a necessity, but many enthusiasts usually end up choosing to wear orienteering clothes for simple practical reasons. Long sleeve tops are sensible for protection against ticks and insect attach, and shin pads stop lacerations from bambles and brashing. 2m Events in Region 1 continue to use AM for the MCW Morse code signature, in contrast to ‘new world’ regions, where FM is sometimes adopted, due to the popularity of the FM-handy. Why stick with AM? It’s primarily a legacy from the long establishment of ARDF in Region-1, but staying with AM has advantages. Simple manually controlled AM receivers, without AGC, make very good DF receivers. i.e. the volume of the received signal is relative to the signal strength. The availability of simple cheap receivers which are intuitive to use, helps to keep the ‘sport’ open for beginners, youth and non-amateurs. ARDF is similar to tracking animal radio tags or using a metal detector. All you have to do just follow the signal. A map is not necessary, so its not strictly ‘orienteering’ ? Foot-Orienteering controls are marked on a map, but following a straight line compass route, will rarely be the best option.! It’s exactly the same for ARDF. In addition, the radio beacons do not transmit continuously, only transmitting for a maximum of 1 minute in a 5 minute cycle. You try to estimate your control locations when the beacons are active, determine a route strategy, and then use the map to navigate to them, exactly as you would in foot-Orienteering. The biggest problem for established orienteers is that it usually takes 3 or 4 events to master the radio techniques. In this learning period, the radio aspect is likely to dominate. If you can persevere, you will be rewarded for your efforts because the combination of radio techniques, fitness and orienteering skills, will help you become truly competitive. The logistics of organizing an ARDF event are much more demanding than a club 2m foxhunt. You will almost certainly need help to assemble all the equipment and need participants from outside your club to make it worthwhile. Planning an ARDF event shares a lot in common with traditional orienteering. Establishing contact with your local Orienteering Club, is very highly recommended. Orienteering Clubs will have maps and knowledge of suitable venues. 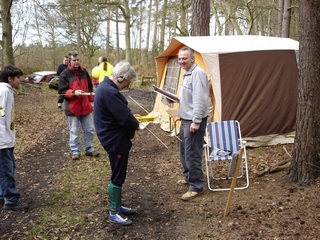 In addition orienteers with a passing interest in technology or Amateur Radio are often keen to try ARDF. Most Orienteering events are open to all, with ‘colour coded’ courses for a wide range of ages and abilities. Just going an event and seeing the organization, will prove to be a valuable experience. If you feel a little more adventurous, take a compass with you and try a beginners ‘Orange’ course for a taster ! See the British Orienteering Federation web site for more information. Please let the existing UK ARDF community know of your ARDF activities so, they can coordinate a national events calendar. See the RSGB Amateur Radio Direction Finding Committee Site for more information.